I’ve sampled a lot of the grilled cheese ideas out there (including mayo on the outside), and these are the ones that work for me. 1) Start with great bread. Now, this isn’t to say that you can’t use any bread that you have in your pantry already. If you have the option, however, I suggest buying some crusty whole grain or regular sourdough for maximally awesome flavor. 2) Top with high quality, sharp cheddar cheese. Sharp cheddar has a lot of flavor, and that’s what we’re going for. 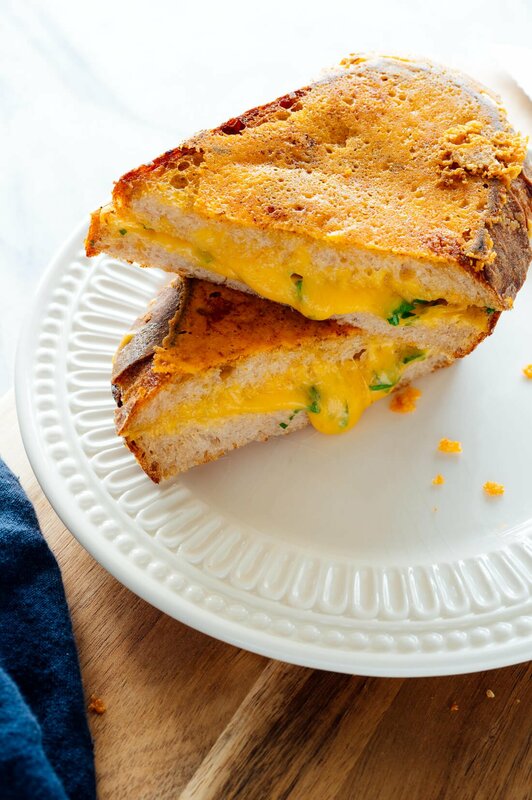 When it comes to a grilled cheese, you really can’t go light on the cheese, or you’re going to be disappointed. 3) Don’t skimp on the butter. You need enough butter to achieve the crackly-crisp, buttery, golden exterior that we all crave. 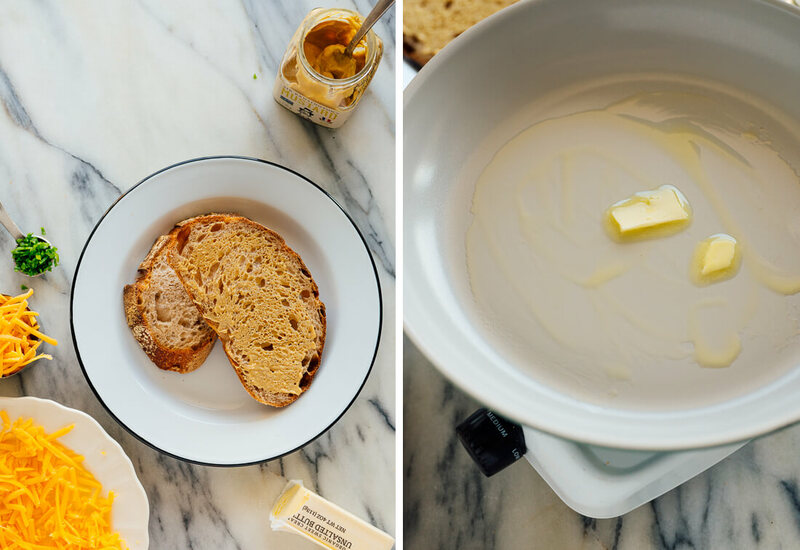 If you always keep a stick of butter on the counter, you can simply spread the softened butter generously over the outside pieces of bread. If you don’t (I don’t), you can melt a pat of butter in the skillet before you add the bread. 4) Grate the cheese yourself. 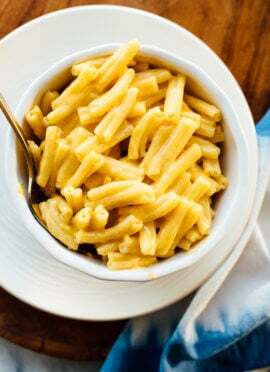 Pre-shredded cheeses are lightly coated in starch so they don’t stick together, but the starch prevents your cheese from melting into gooey oblivion. We want gooey oblivion. 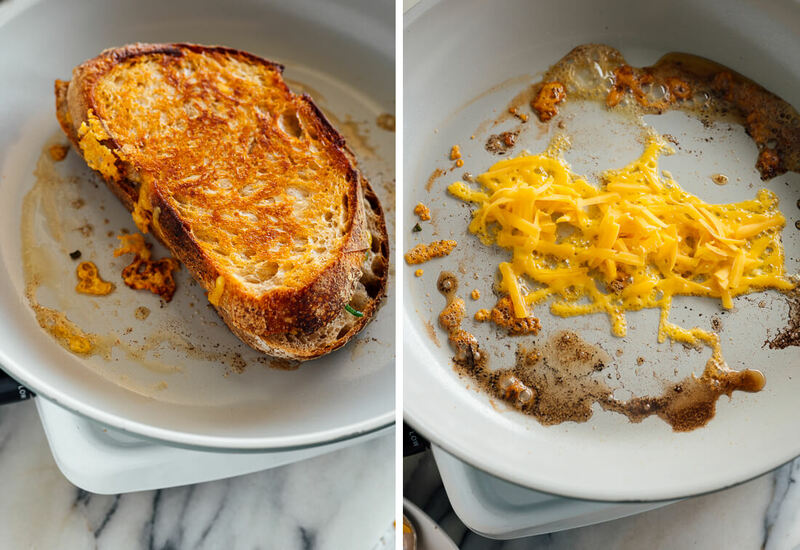 5) Cover your grilled cheese while it cooks. 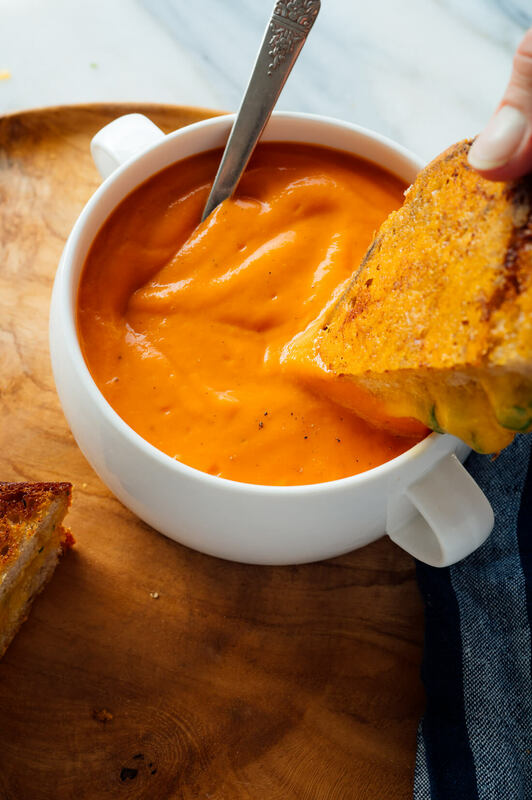 This helps trap the heat, which ensures that your grilled cheese has time to melt all the way through without burning on the outside. 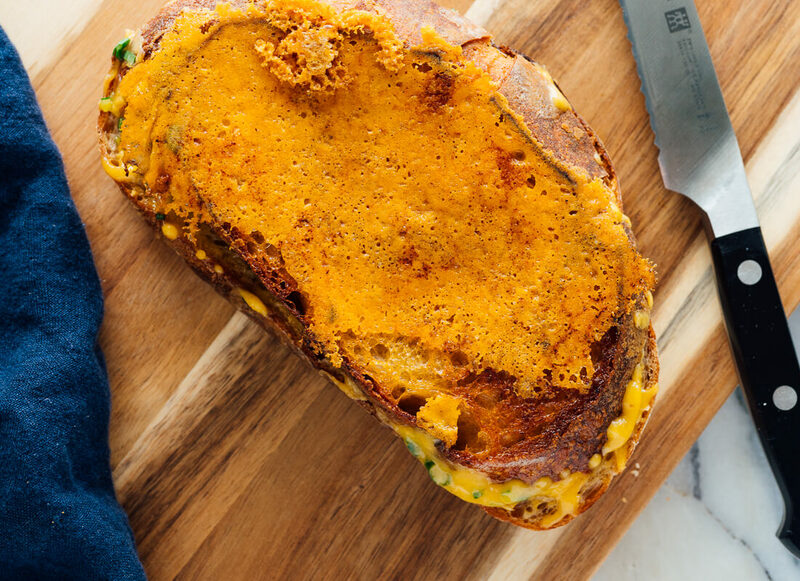 Finish your grilled cheese with a crispy, cheesy outer crust. This is a trick that my grandmother Mimi used to pull off, and it is only possible if you have a truly non-stick skillet. * Maybe you have encountered it at a restaurant and wondered how it works. It’s so easy! Simply sprinkle some additional grated cheese over your buttery skillet, and flip the hot sandwich over on top of it. Listen, and once the cheese has stopped sizzling, wait a few more moments longer before flipping it back over. Ta da. *Non-stick skillet notes: I have always recommended using cast iron or stainless steel skillets when possible, since they’re non-toxic. I’ve been testing out this non-toxic, non-stick skillet set since December (courtesy of Food52/affiliate link) and I think it deserves a shout-out. These skillets are awesome, and I haven’t babied them at all—I’ve been washing them in the dishwasher, and stacking them when not in use. In fact, I like them so much that I just bought a set for my brother for his birthday. 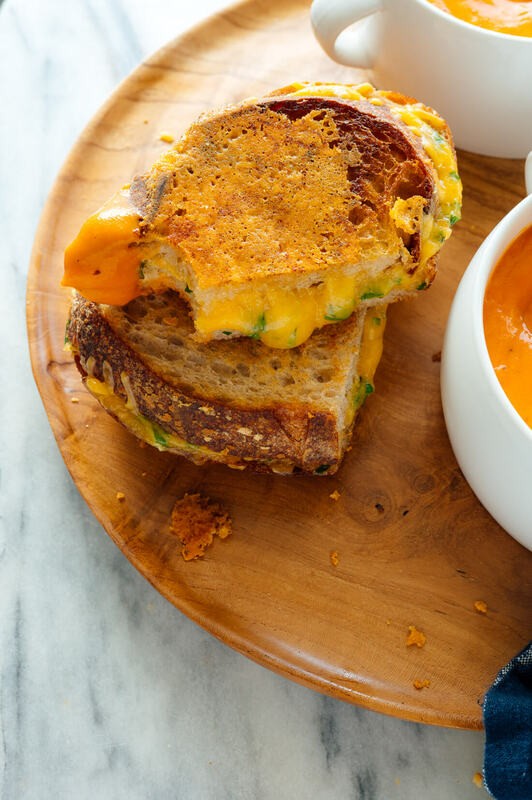 Here’s how to turn a basic grilled cheese into a grown-up, gourmet grilled cheese. Take my basic methods (described above) and add a couple more ingredients. You will not believe how much of a difference they make! That said, if you’re serving a picky kid, you can leave these out. Spread a light layer of Dijon mustard over your bread. I mean, a really light layer over one slice of bread. Even if you don’t love mustard, this adds a little je ne said quoi to your sandwich. It’s a little salty and complex, and I think you’re going to love it. Alliums (the garlic and onion family) have the power to transform ho-hum recipes into totally irresistible. I always have green onions in my fridge, and adding some chopped raw green onion (green parts only) is an easy way to infuse your sandwich with major flavor. That’s it! 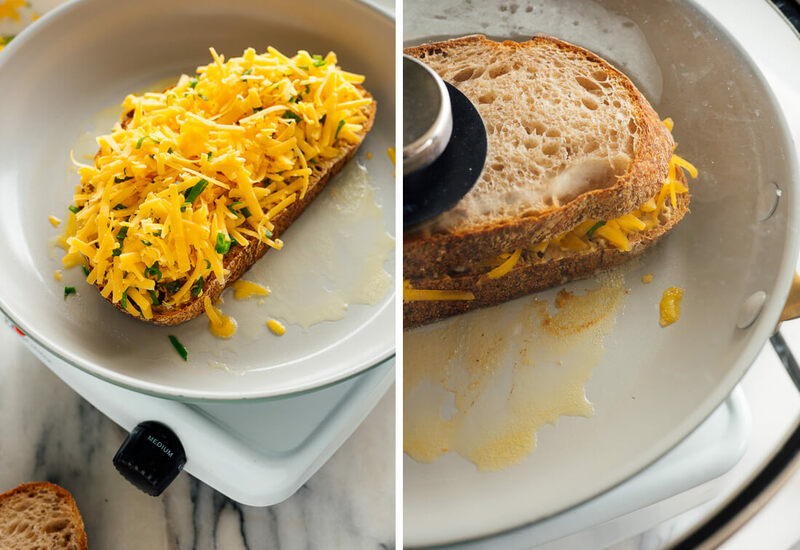 Ready to make the best grilled cheese sandwich you’ve ever had? 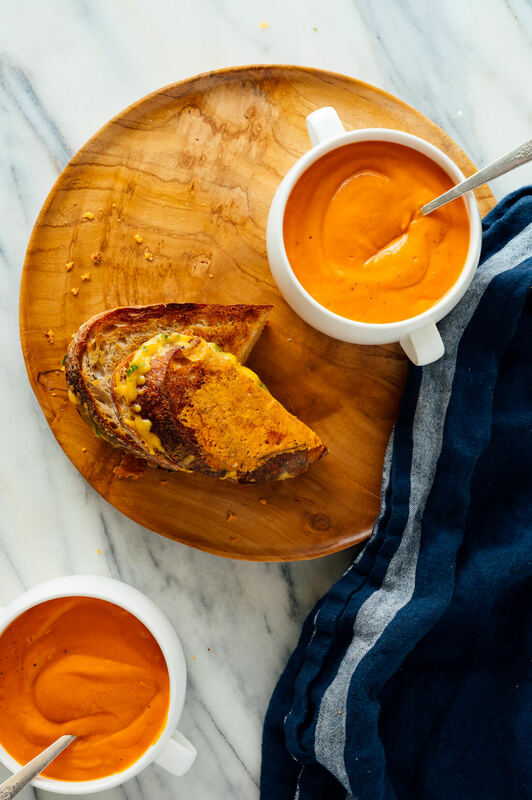 They’re perfect for chilly or rainy days, and even better with a side of classic tomato soup. Please let me know how these sandwiches turn out for you in the comments! I hope you love them as much as I do. 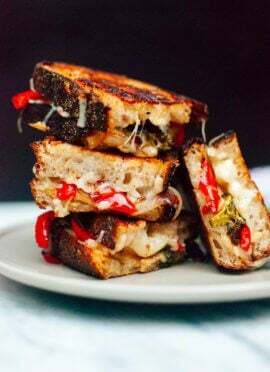 This roasted vegetable and balsamic grilled cheese sandwich puts these principles to work, but replaces some of the cheese with roasted veggies. You can’t go wrong here. This fresh hummus and pickled vegetable sandwich is absurdly tasty. The components are worth the effort, and you can make these sandwiches all week long. 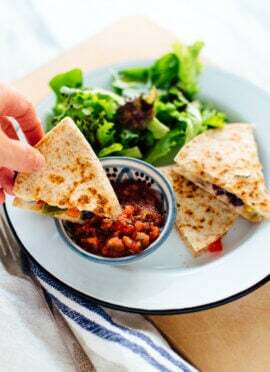 My broccoli pita sandwiches feature a fresh broccoli and chickpea salad stuffed into warmed pita slathered with mashed avocado. Top the slice with the oniony cheese (aim for about a ¾-inch layer of cheese). Then place the remaining slice of bread on top. Cover the skillet with a lid, and cook for several minutes, or until the underside of the bread is golden. Thanks for the tips re the mustard on the outside, and the final coating of melted cheese. I will definitely be trying that out. I like to think my grilled cheese sandwiches are pretty terrific already, but I’m always game to kick things up a notch. BTW, I often make our grilled cheese with slices of whole onion and a few hot banana peppers in them. Definitely yum! Thanks for your great blog. I always look forward to receiving it and have tried many of your great recipes. This post really made me smile! I always wanted to be famous for a special food that I cooked “the best” in my family’s (and extended family’s) opinion lol so I can identify with that. Everything bagel seasoning on the cheese. That sounds like a good addition! Kate, now you can always have soft, spreadable butter without it spoiling. I have used this butter keeper for years, all year round, and have given many to friends. It holds one stick of butter. Just change the water every 3 days and put it in the fridge if you will be away for a while. That’s crazy! I didn’t even know that was possible. Tried this with the dijon and green onion. It was fabulous! 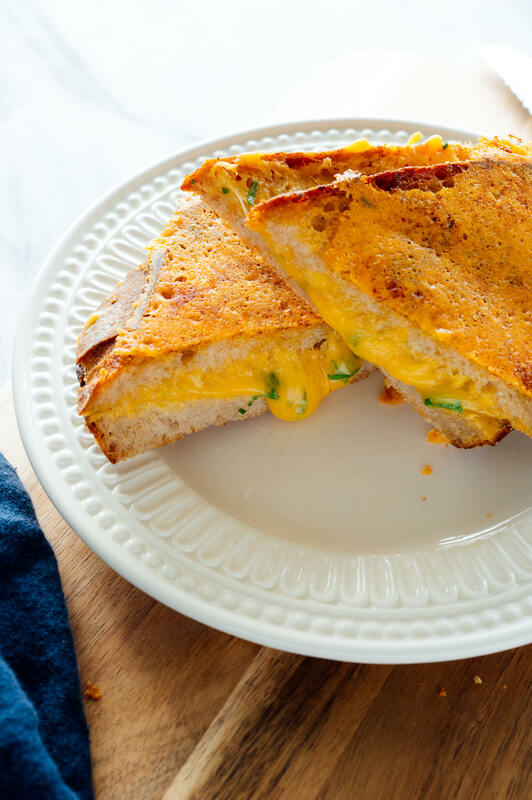 Still a classic grilled cheese but with a big step up in flavour. Loved it! I’m glad you loved it! Thanks for your review, Louise! I seriously need to step up my grilled cheese game! I love the cheesy crust on the outside. This recipe is my daughters favorite breakfast, and trust she is hard to please so thank you and look forward to try many more. I’m happy to hear that, Rony! I’m happy you loved it, Lola! We use alternately, Ezekiel sprouted bread, or marble rye from Giant Eagle because those breads are the best diabetic-friendly breads I can come up with. I sometimes sprinkle some freshly-grated parmesano reggiano on them because the intense nuttiness adds a delicious ZIP! Add a couple of sandwich-sliced Claussen pickles and some tomato soup: de-lightful! No spreads or onions for us either.